vandhadhu – bad would be there? igazhgai – find faults in other things? 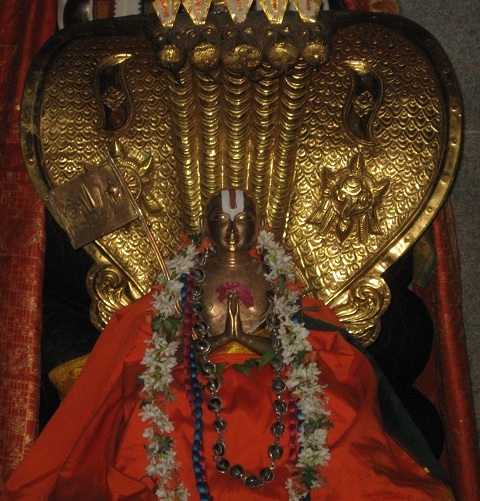 He asks in his mind, “dhEvarIr (your highness) divined ‘pinnavarum kaRka upadhEsamAip pEsuginREn manniya seer veNpAvil vaiththu [pAsuram 1]’ (that I am saying it as an advice using veNpA poetry form, for future generation to learn and follow), but those who are immersed in jealousy would criticize this effort wouldn’t they?”; and then he calms down his mind by saying that there is no harm done, and such behaviour of them is nothing to be surprised about. kalvi thannil Asai uLLOr peRROm ena ugandhu pinbu kaRpar – When we would have had to learn with great efforts from those who have learned and understood, now we are getting very easily through this prabandham! – and so the people who are very interested in learning this would say and become happy like they got a big wealth, by getting this, (pinbu kaRpar) and they would learn well from those who have learned and understood well, and be satisfied. vandhadhu en nenjE – Oh mind! as you are fully in congruence with the one (emperumAn) who possesses all the glories, there is no worry/problem (if they find faults); since they are ‘manakkuRRa mAndhar [rAmAnusa nURRanthAdhi – 5]’ (~people whose mind is faulty), if they ridicule, then that would be a praise is what we think isn’t it? From this, we conclude that the liking and disliking of good and the bad people respectively both would add to the greatness of the prabandham. This entry was posted in Other, upadhESa raththina mAlai and tagged 74, annan, erumbi, erumbiappa, kovil, mamunigal, manavala, pasurams, rathina, rathinamalai, raththina, raththinamalai, upadesa, upadhesa on December 1, 2015 by raghuram.